A lifting and relaying service is offered . 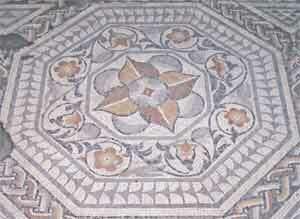 Archaeological mosaics can be lifted from sites, and mosaics on old, often heavy mounts can be removed from the old mounts, and modern light weight supports applied instead. The Blackfriars Pavement (right) in the Jewry Wall Museum, Leicester was lifted, along with other smaller mosaics, by Theo Sturge. 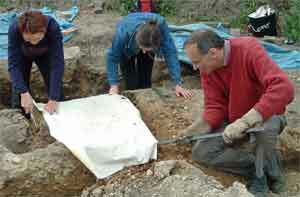 Theo Sturge (right) is seen here running a mosaic lifting workshop for the United Kingdom Institute for Conservation (now Institute of Conservation) Archaeology Section. If you are unsure if work is possible, please make contact and find out. Contact details are on the home page.